They can be seen on construction sites or roadsides, doing the work Thais no longer want to do: Migrant workers from Cambodia, Myanmar and Laos are everywhere in Pattaya, but live most their lives in the shadow of the city’s neon signs and beach resorts, spending their few free hours with countrymen and trying to avoid trouble with the locals. Thailand’s reputation for treatment of its large migrant workforce – estimated in the millions – is not a good one. Put in the spotlight by this year’s human-trafficking scandal, the European Union’s criticism of the Thai fishing industry and the ongoing prosecution of two Burmese men for the murder of two British backpackers in Koh Tao, Thais have drawn international scorn for the rampant abuse of their poorer foreign neighbors who often are mistreated without the safeguard of rights held by citizens. 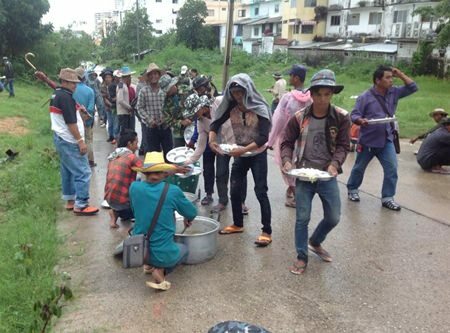 Cambodian workers take a break from working in the rain to enjoy a quick lunch. While some Thais would hate to admit it, the country would grind to a halt without a steady supply of migrant workers to do the backbreaking manual labor a shrinking number of Thais want to. Take, for example, the two teams of Cambodian workers planting trees and manicuring gardens in the pouring rain Oct. 7 on Pratamnak Road. 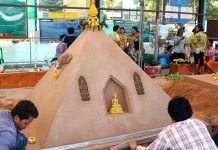 Hired by Nong Nooch Land and Garden Design Co. in August to carry out its Pattaya street-beautification contract, the Cambodians get a free meal a day and some temporary accommodations for the minimum wage of 300 baht a day. While barely a livable wage in Pattaya, the minimum salary can be twice or more of that at home where the minimum wage for Cambodians working in textile factories was raised last week to 168 baht a day starting next year. Garment workers, however, are the only ones guaranteed a minimum wage. Khmers working in other industries earn even less. This is why Thai contractors, homeowners and businesses can find a ready and willing workforce to take jobs lifting heavy cement bags, operating heavy machinery and working in dangerous conditions on building sites, fishing boats and highway medians. One Pattaya-area Cambodian, who declined to provide his name, said he has been working in Thailand for three years to support his extended family back home. He said he was happy with his work and is well looked after. His employer provides a room to stay in, he gets days off and is encouraged to work even harder with extra bonuses and tips. He said he doesn’t worry much about leisure time, though he occasionally takes advantage of Pattaya’s beaches and attractions on long holidays. 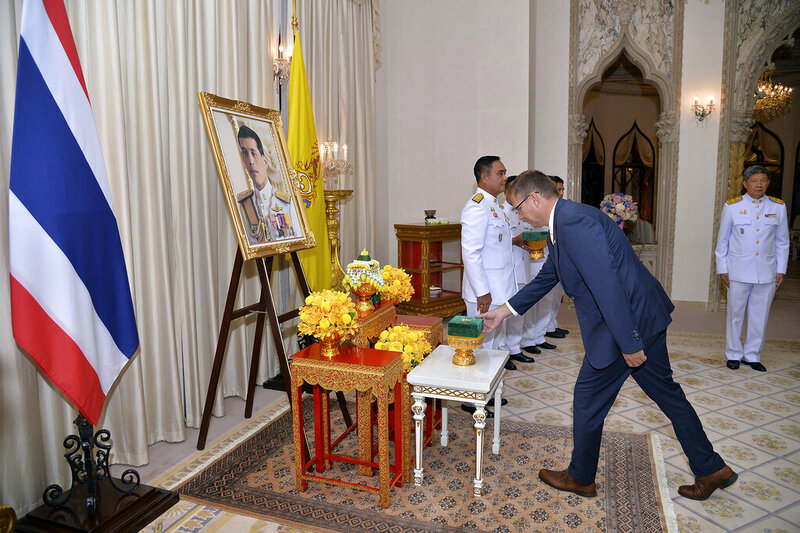 However, the Cambodian said, he sticks to friends from his own country as he fears getting into a misunderstanding that would offend local Thais.